These days more and more restaurants are being financed by crowdfunding. One of the first to set the crowdfunding ball running in 2013 was The Clove Club in London's Shoreditch, which was partly funded by a £250,000 crowdfunding campaign. A particularly spectacular case was Thai restaurant Som Saa in 2015, who forked in £700,000 on Crowdcube in just four days, £150,000 above the crowdfunding target! A famous example outside London is Chester chef and restaurateur Gary Usher, who has managed to fund no fewer than three restaurants through crowdfunding, hitting a £200,000 target for his latest restaurant Wreckfish just last May. Another noticeable and successful campaign was launched by chef Paul Foster early 2016, who needed £100,000 of crowdfunding to open his first solo restaurant. Initially the location of the restaurant would be in Royal Leamington Spa, but after a deal on a site there fell through, he found a new place in Stratford-upon-Avon, where he opened "Salt" in April 2017. Paul Foster is an experienced chef who has received his training in the kitchens of a number of well-known restaurants, such as Restaurant Sat Bains in Nottingham, Raymond Blanc's Le Manoir aux Quat'Saisons in Great Milton, Wylie Dufresne's WD-50 in New York City, Thomas Keller's The French Laundry in Yountville, and Marc Haeberlin's Auberge de l'Il in Illhausern. 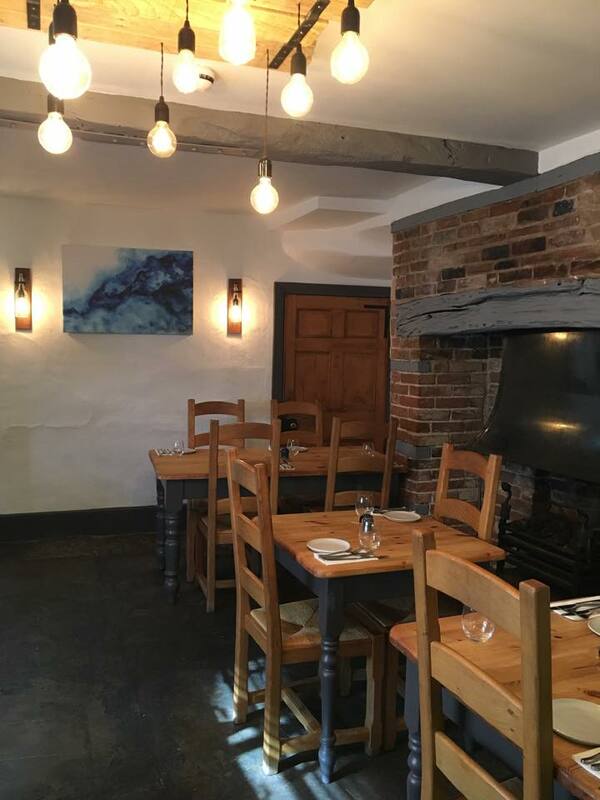 In more recent years, Paul Foster held head chef positions at the critically acclaimed restaurants Tuddenham Mill in Suffolk (from 2010 till 2014) and The Dining Room at the Mallory Court Hotel in Royal Leamington Spa (from 2014 till 2016). Salt is open for lunch Wednesday through Sunday and for dinner Wednesday through Saturday. 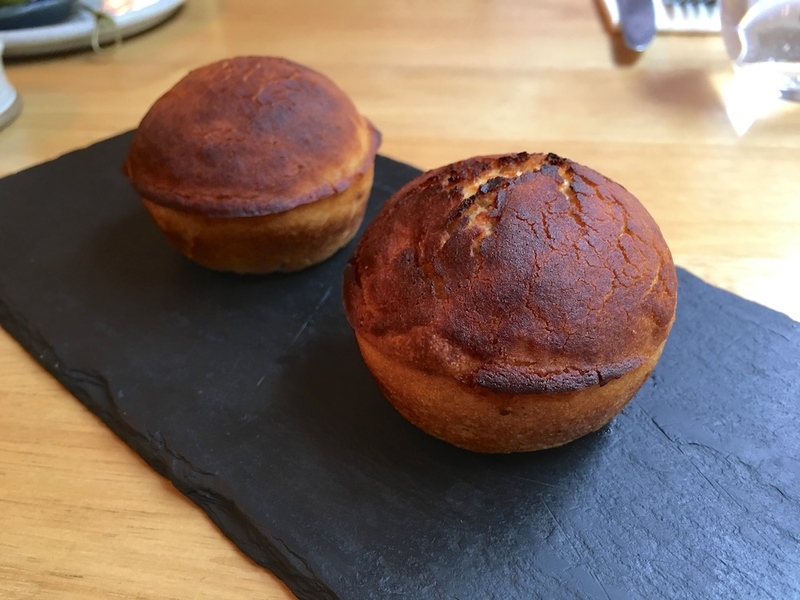 At lunchtime you can choose between a set lunch menu (2 courses £15, 3 courses £19.50) or the 6-course tasting menu priced at £42.50, and there's a special Sunday lunch menu (2 courses £23, 3 courses £27). In the evenings there's an à la carte menu (2 courses £32, 3 courses £37) and a 7-course tasting menu for £62. 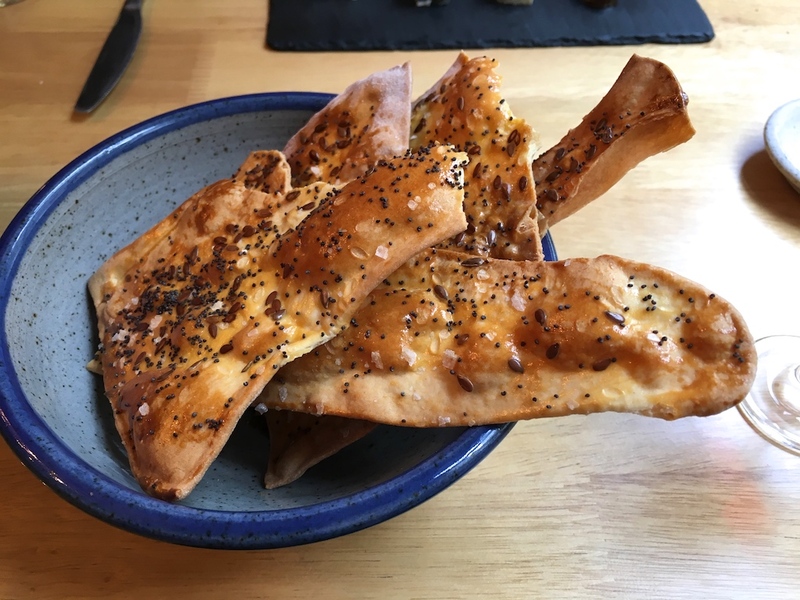 I had lunch with my husband at Salt in June 2017 and we both ordered the tasting menu (which consisted of 5 courses that day for the bargain price of £35) plus an extra cheese course (£8). Lunch kicked off with some delicious salt and vinegar popcorn and olives, shortly after followed by some wonderful, warm, homemade malt bread. 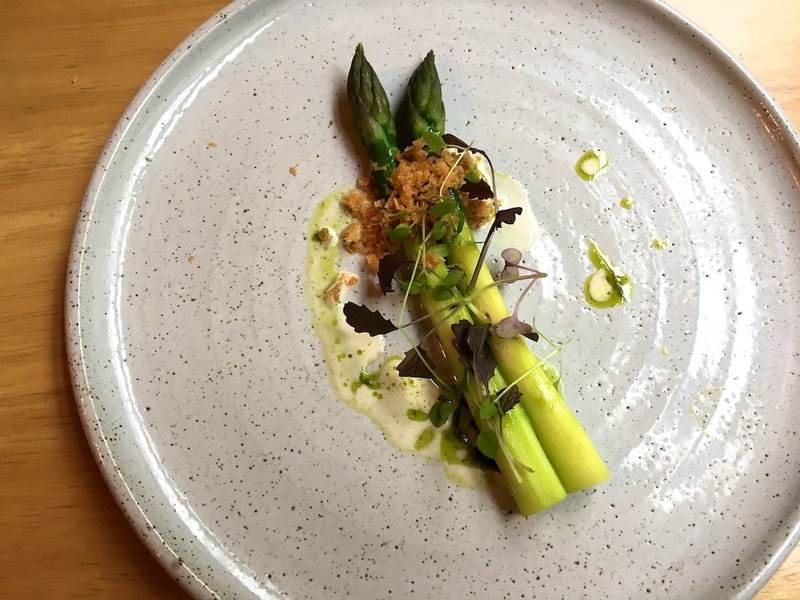 First course of the tasting menu was English asparagus (Wye Valley), gently blanched, and served with crunchy chicken crumbs, and a light dressing of cream and lovage oil. An attractive dish with clean flavours, the saltiness of the chicken crumbs providing just the right seasoning, and the lovage gave the dish a lovely finish. 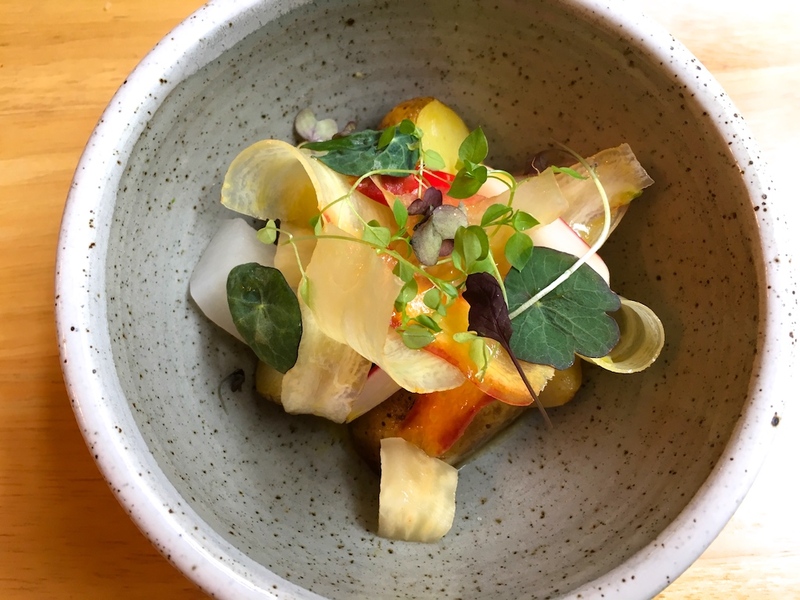 Even better was the next dish of Jersey Royal potatoes served with a gorgeous bone marrow butter and various "acidulated" vegetables, such as celeriac and turnip. A creative and well-conceived dish, the sharp and crunchy vegetables providing a nice flavour and texture contrast to the warm and comforting potatoes. 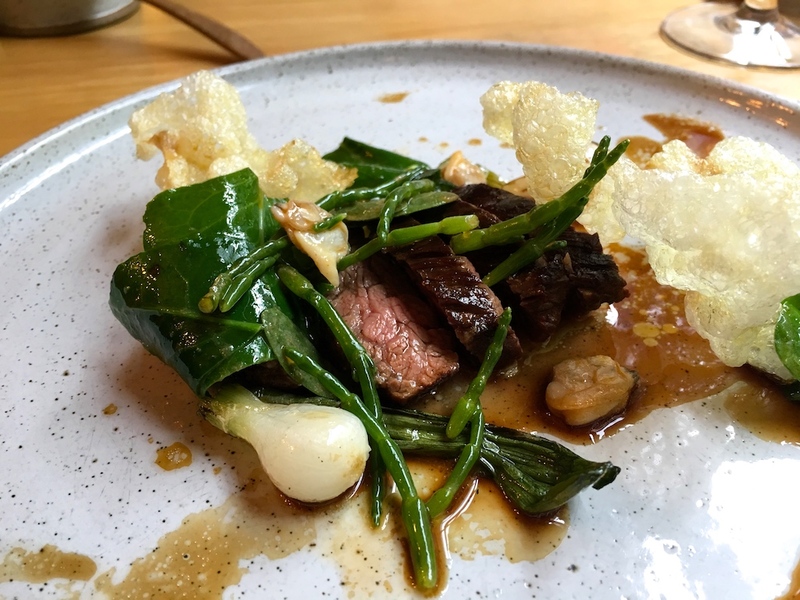 The main course today was flavoursome and juicy barbecued hanger steak, complemented by a terrific, incredibly tasty beef jus, and served with grilled spring onions, sea vegetables including samphire, palourde clams, and some crisp, puffed, beef crackers. 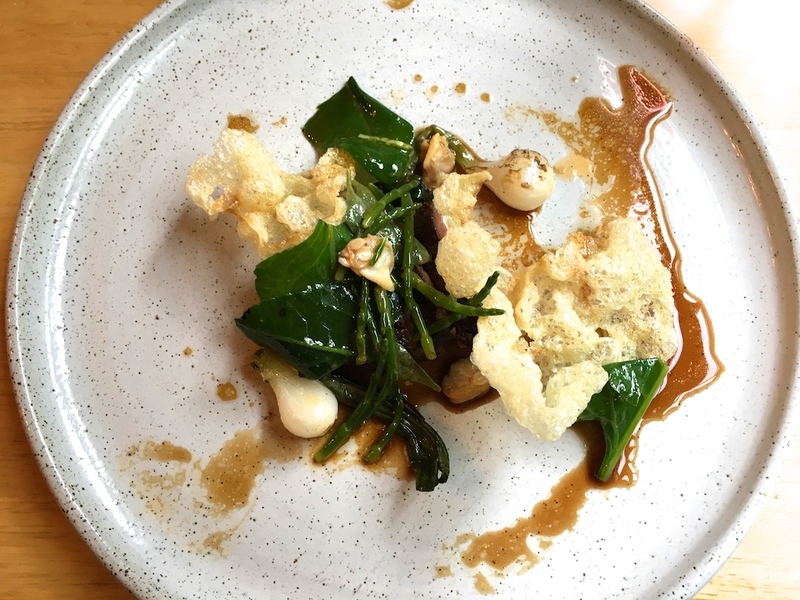 An excellent dish, the robust beef flavours set off nicely by the salinity of the sea vegetables and clams, and the beef crackers were a nice, original touch. 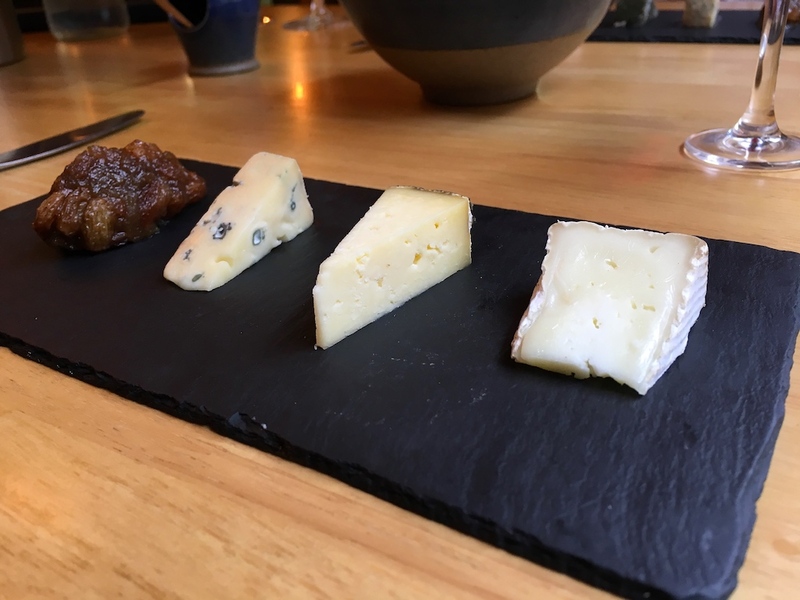 Next up was the extra cheese course, composed today of Oxford blue, Cornish Yarg and Wigmore, and accompanied by some deliciously crisp, home baked, lavoche crispbread and spiced apple and raisin chutney. The meal was concluded by two desserts. 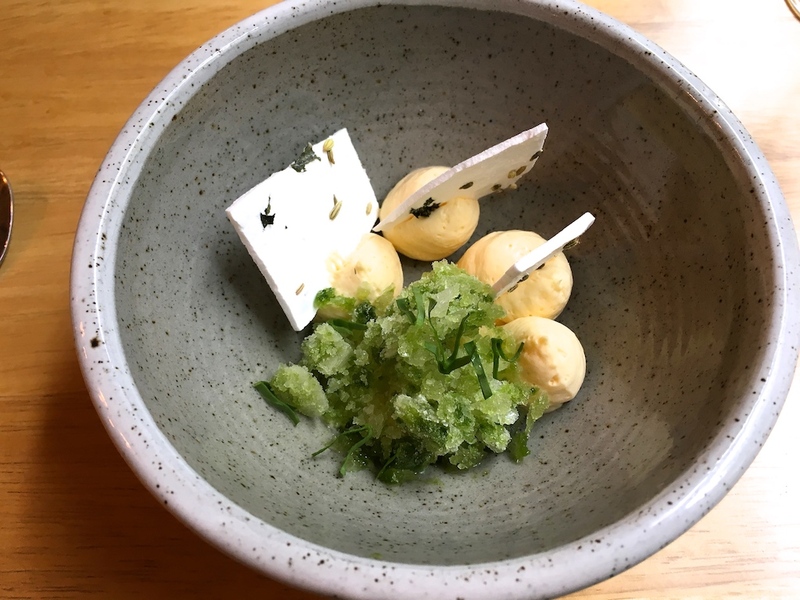 First up was a very pleasing combination of nice and tangy whipped lime curd, yoghurt parfait, dehydrated meringues with fennel seeds and a refreshing sorrel granita. A well-made, modern dessert with lovely temperature and texture contrasts, and the clever fennel meringue pieces gave the dish a wonderful finish. Strawberries, white chocolate and elderflowers followed. 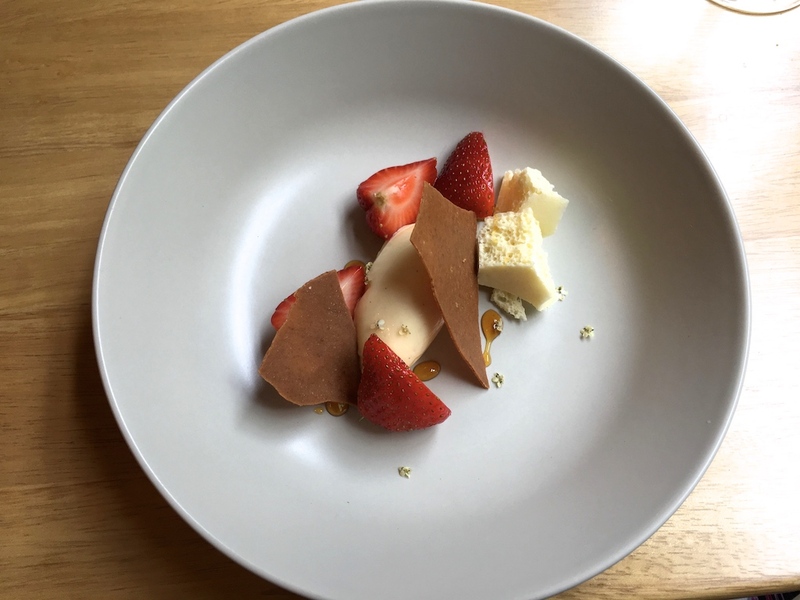 Lovely fresh British strawberries and the white chocolate was served in three ways, a mousse, chunks of aerated white chocolate, and caramelised white chocolate chards. I wasn't too keen on this dessert; overall there was too much white chocolate on the plate and the white chocolate mousse was too heavy in texture and flavour. My lunch at Salt was a very pleasant and positive experience. The strawberry and white chocolate dessert was the only let-down of the meal, but the quality of the other dishes made up for that. Attractive, ungimmicky dishes with the right touch of refinement. The food at Salt delivers on the promise made on the menu. No faffing with ingredients; clean and distinctive flavours. A real antidote to dreaded conversations like "hmm, the menu mentioned tarragon" ....."I can't taste any tarragon" or "didn't the menu say crab? ... "I can't find any crab". Adding to the experience was the friendly staff. When Paul Foster started his crowdfunding campaign, he said that he wanted to create a modern and relaxed restaurant that wasn't "too fine dining". I think he's done exactly that.